Zachary is excited to help people of all ages in the Maddington area using hands-on chiropractic. 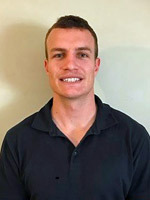 He is trained in diversified adjustments, activator, dry needling, drop piece, trigger point/massage, kinesiotaping and instrument assisted techniques. Give Perth Sports Injury Clinic a call to schedule an appointment today!